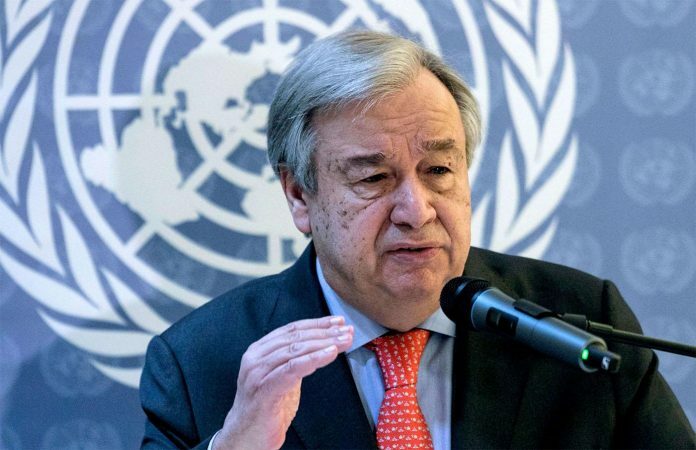 According to details, UN Secretary-General Antonio Guterres has strongly condemned the bomb attack in Quetta in which 20 people were killed and 48 wounded. He also extends his condolences to the families of the victims and to the Government and people. Earlier on Friday a massive explosion killed at least 20 people at a busy vegetable market in Quetta, the capital city of Balochistan. Eight people from Hazara community, an FC official, two children are among the dead. At least 48 people received injuries and nearby buildings and vehicles were damaged by the blast. ISIS has claimed the responsibility of the attack. After the attack, a protest was carried out by Hazara community and they blocked the road for traffic. Members of the Hazara community, including women and children, also walked through the streets and later staged a protest in front of the Quetta Press Club. Protesters demanded immediate action against the elements involved in the attack and called for implementing the National Action Plan without any discrimination. They said it was the responsibility of the state to provide security to the people.